Good morning from Milano-Torino NamedSport, first held in 1876, the oldest race on the international calendar. The first edition was won by the extraordinary Paolo Magretti, naturalist, explorer and cyclist. This year’s edition started this morning in Magenta, and it finishes this afternoon, after 200km, at the Basilica on the beautiful Superga – the hill that overlooks the city of Turin. Among the starters some of the top names in cycling, including the new Road World Champion Alejandro Valverde, Miguel Angel Lopez, Gianni Moscon, Thibaut Pinot, Adam Yates, Vuelta a España runner-up Enric Mas, Bob Jungels, Tim Wellens, Rafal Majka, Bauke Mollema, Rui Costa, Dan Martin, Fabio Aru, Ilnur Zakarin, Warren Barguil, Tiesj Benoot, Giovanni Visconti, Domenico Pozzovivo and Wilco Kelderman. 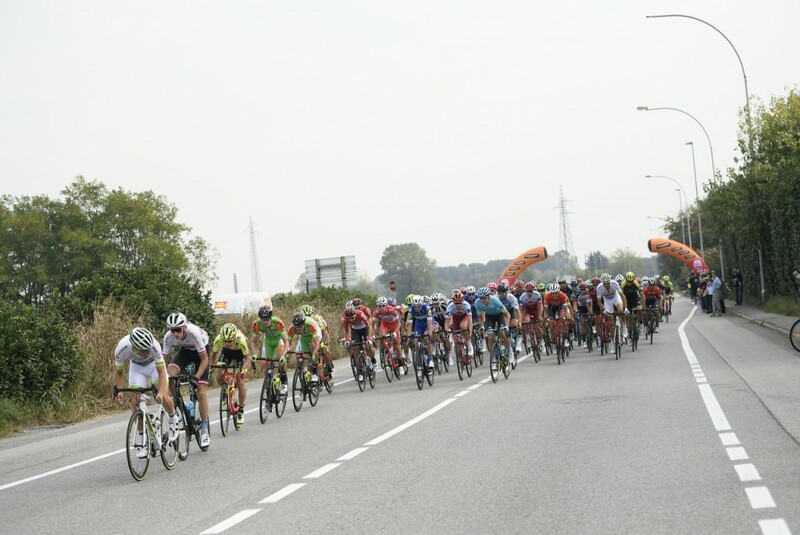 The peloton, 146 riders strong, passed km 0 at 11:51. Magenta, 11:45: scattered clouds, 21°C. Wind: moderate, 11km/h. Turin, 16:15: variable, 16°C. Wind: weak, 8km/h. Magenta is located 20 minutes from Malpensa airport and 20 km from Milan. Originally a village in the 14th century, and a city since 1947, it now has a population of approximately 23,000. Villa Castiglioni houses the seat of the Parco del Ticino, and the surrounding territory has a rich natural and farming landscape, with an invaluable forest heritage that has already disappeared elsewhere in the Po Valley. The city is mainly remembered for the historical battle fought on 4 June 1859, a decisive event of the Second Italian War of Independence, as part of the Italian Risorgimento and Unification. The Battle of Magenta is remembered every year on the first Sunday in June with a festival that is a celebration of history and culture, as well as solidarity and unity among the nations. The historical re-enactment in period costumes is the highlight of this event. Major landmarks include Casa Giacobbe and the ossuary in remembrance of the battle, and are open to the public. The Lyric Theatre, the Magenta Orchestra, three historic bands, as well as a number of choirs and events speak to the long-standing musical tradition of the city. This ducal city’s salad days were under the Viscontis and the Sforza. The Cathedral is dedicated to Saint Ambrose, the town’s patron saint, and overlooks the magnificent Piazza Ducale – built in just two years by Ludovico Maria Sforza, also known as Ludovico il Moro. Under Bramante’s Tower, the road leads to the Sforza Castle (Italian: Castello Sforzesco), in the valley of the River Ticino. The church of St Peter the Martyr (Italian: San Pietro Martire) is another important landmark. The village of Giarole was founded in the 13th century, when the local population moved from the surroundings of the church of San Pietro and relocated around the newly built castle. The palace was constructed by the Sannazzaro family, following the authorisation of Emperor Barbarossa. The castle was captured by the Palaeologus during the war against the Visconti of Milan in 1338, and was only returned in 1380. It was reconstructed and remodelled over time, and today the oldest wing is the one that extends towards the 14-century church of San Giacomo, while the southwest and northeast towers date back to the 15th century. The two major renovation works involved the castle wing closer to the village in the 1700s, and the entire building, including part of the interior, in the mid-19th century. A small town in the hinterland of Turin, built around a 1000-year-old Benedictine abbey. The comune includes the Superga Natural Park, a protected area with trails and paths that lead up to the Basilica, and the finish line of the Milano-Torino NamedSport. The park has some curious architectural landmarks, including the Villa Lavista, an eclectic mansion in three different styles: Baroque, Neoclassica; and early-Art Nouveau. Torino is a notable tourist destination, thanks to its many architectural landmarks and museums, including the second largest Egyptian museum in the world after the one in Cairo; the Museum of Cinema inside the Mole Antonelliana; and the Residences of the Royal House of Savoy, which are UNESCO World Heritage Sites. After the 2006 Olympics, it became a major seat for many sporting events. In 2016, it hosted the Giro d’Italia’s grand finale and the Olympic basketball qualifying tournament. Historically, it has been home to two major Italian football clubs, Juventus and Torino; more recently, since 2015, it has made its comeback to the top league in basketball, with the Auxilium Cus Torino team. Many worldwide recognised symbols of “made in Italy” were born here, including Martini vermouth, Gianduia chocolate and espresso coffee. Furthermore, the city is the major hub for Italian automotive production, being the seat of FCA and of its brands that marked the history of car manufacture. The verdant hills overlooking the city, opposite the mountains, are home to the majestic Basilica of Superga, the finish location of the Classic. It is connected to the city either by the race route or by the Sassi tramway, which runs along the hill. The Basilica was commissioned by Victor Amadeus II, Duke of Savoy, and designed by the gifted architect, Juvarra (as was the Palazzo Madama). This Baroque building houses the Royal Tombs, made for the members of the House of Savoy, which can be accessed from inside the Basilica. More recently, Superga has become a pilgrimage destination for the fans of Torino FC, every year on May 4 since 1949. A memorial stone (which can be reached from the path running left of the building) was erected at the back of the Basilica, to commemorate the “Grande Torino”, the great team that fell victim to an air disaster on the hill of Superga, while flying back home after a game in Lisbon.